Jack Brickhouse (left) made sure the Chicago audience welcomed (from left) Ernie Banks, Billy Williams and Minnie Minoso, who called the broadcaster his “buddy.” Banks, Williams photo credit Leo Bauby. Three dimensions were not enough to apply when sizing up Jack Brickhouse. A broadcaster with somehow enough hours in his day to do play-by-play for the Cubs, White Sox, Bears and Bulls in 1966 and 1967, Brickhouse’s true impact on his adopted city can’t really be measured by his on-air work during his long, full 82 years on Earth. 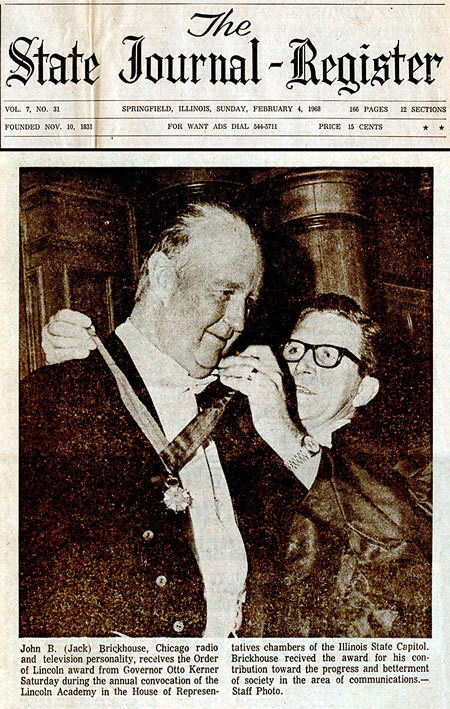 Brickhouse made news early in 1968 when he received the Order of Lincoln from Gov. Otto Kerner at the Illinois Statehouse in Springfield. A gentleman who exuded sunny optimism on the air with countless “Hey, Heys” and “Oh, brothers!,” Brickhouse would have been a super salesman if he could have foregone sleep. “Never take the first ‘no’ for an answer,” he counseled late in his life, and he meant it. To his legion of viewers, including several generations of kids who’d run home from school to catch the tail end of his baseball telecasts, he wouldn’t allow negativity. They caught on to his sales pitch. Brickhouse peddled passion for the game. “I would say it had a major, major impact on my baseball career and broadcast career,” said Cubs radio color analyst Ron Coomer, who grew up watching Brickhouse, first in a Chicago neighborhood near Midway Airport, then in southwest suburban Lockport. Coomer’s words were echoed by countless players and fans growing up within signal range of Brickhouse. In a five-channel universe, his voice and face were first among equals. His catch phrases, mimicked in baseball press boxes for decades, far outlived his mortal form. Although Harry Caray sold the sizzle of baseball and was first with a statue near Wrigley Field, Brickhouse was the steak, more than doubling Caray’s tenure here and leaving him light years behind in total number of hours on the air in sports, separate from the news and other programming on which he appeared. Brickhouse, possibly the most ubiquitous local broadcaster in any market in from 1940 to 1981, was certainly the ringmaster of Chicago’s toy factory in his time. He broadcast eight no-hitters, including Don Cardwell’s masterpiece in 1960 at Wrigley Field. The scene for which he expertly ad-libbed included at least 6,000 fans storming the field, mimicking a World Series celebration. Watch the last out and aftermath of Don Cardwell’s no-hitter in 1960, likely the oldest sports videotape of any kind in existence. Even with the excitement of no-nos, great personal achievements by Chicago athletes, the 1963 Bears NFL title and 1959 White Sox World Series, Brickhouse relished non-sports assignments as much as the games themselves. He dovetailed with broadcast history even on the sports beat. In 1962, several minutes of a Cubs-Phillies telecast from Wrigley Field was included in the first over-the-air trans-Atlantic satellite broadcast via the newly-launched Telstar. Fittingly, it was Brickhouse’s voice providing a slice of Americana to European viewers after Walter Cronkite and Chet Huntley had provided the proper introductions. Watch how Jack Brickhouse handles play by play of the color clip of a Cubs game being fed to Europe on the first trans-Atlantic satellite broadcast in 1962. And yet there was an even more impactful part of his life that takes a back seat in all the biographies and narratives of his unparalleled career. He used his celebrity to help others – and also employed his bully pulpit to present athletes of color as equal human beings at a time when society was just toying with the concept of civil rights and integration. Being complimented on-air by Jack Brickhouse and, most importantly, being consistently selected for interviews on the Midwest’s most-watched combination sports-and-news television outlet did much to advance the image of people of minorities. His most important legacy was his on-air treatment of the first generation of African-American and Latin athletes to grace Chicago teams. For evidence of Brickhouse’s impact on this issue, just ask the incomparable Minnie Minoso, pushing 90. “He was my buddy,” Minoso said, and that was no small feat. He was a black Cuban, barely speaking English, breaking into the White Sox in May 1951. 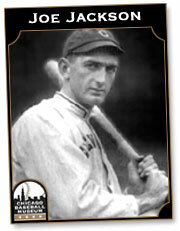 Jack Rosenberg, Brickhouse’s WGN sports editor and writer, said his old colleague was color-blind in relating to ballplayers. Brickhouse would be seen around the GOP candidates at election time, and was friends with Republican power brokers. But while many of them kept the civil-rights movement at arm’s length, with McCormick’s editorial heirs doing nothing to portray the movement favorably, Brickhouse was at least color-blind in recognizing his fellow man and he clearly leaned toward using his celebrity to do good. “Who did more (positively) for racial issues for Chicago when this town was torn by that in the Fifties?,” asks longtime Chicago broadcaster Chet Coppock, who was as close as anyone growing up to Brickhouse, a family friend with whom the Coppocks spent many a Thanksgiving and Christmas in the north suburbs. Shortly before his death in 1998, Brickhouse recalled the shyness of Ernie Banks and Billy Williams in interviews when they first broke in with the Cubs. But he kept at it, and by mid-career Banks and Williams could handle the give-and-take of those very public conversations. They included the daily in-season “Tenth Inning” post-game show or Brickhouse-hosted “Sports Open Line” panel programs from the WGN studios on Monday nights. Listen to how Jack Brickhouse recalled how reticent Ernie Banks and Billy Williams were early in their careers. Listen to a 1968 interview where Billy Williams talks about the possibility of playing in 1,000 straight games. He ended up playing in 1,117 in a row. Brickhouse did not limit his color-blind, non-patronizing treatment to interviewees. He actively helped break the color line in the WGN sports department. 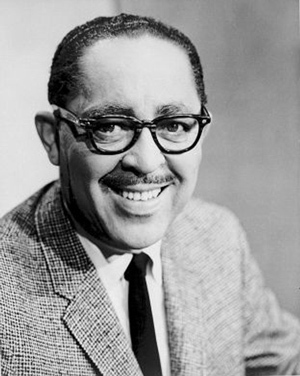 Wendell Smith could thank Jack Brickhouse for boosting him into status as the first African-American regular on a 10 p.m. Chicago newscast in 1967. At 87, Rosenberg cannot specifically remember whether Brickhouse was instrumental in the 1964 hiring of Wendell Smith, Jackie Robinson’s Boswell and the first African-American sportswriter at a downtown Chicago daily newspaper. However, with Brickhouse holding an executive title and negotiating station TV rights contracts with Chicago sports teams in the 1960s his stature at WGN was very high. Station boss Ward Quaal would surely have allowed the “Big Brick” to be instrumental in hiring Smith. Smith eventually became the 10 p.m. WGN sports anchor as the first African-American regular on any Chicago station’s signature news program. Previously, the station’s only black on-air talent had been deejay Daddie-O-Daylie, consigned to the overnight hours on the radio side in the mid-1950s, pre-Franklyn MacCormack’s “Meister Brau Showcase.” The parent Chicago Tribune had no African-American editorial staffers. Listen to 10 p.m. sports anchor Wendell Smith narrate Jack Brickhouse’s calls of Adolfo Phillips’ four homers in a doubleheader on June 11, 1967. A few years after Smith began, Banks came on board to do short-form TV and radio gigs, including Sunday-night sports anchoring that is still remembered for Mr. Cub’s language mangling. Brickhouse once recalled how he worked with Banks on diction, and Ernie seemed to catch on in dry runs. But when the camera’s red light flashed on, “Mr. Cub” reverted to form. Overall, Brickhouse believed in a big-tent theory in hiring. Brickhouse’s endorsement of equal opportunity wasn’t limited to his own workplace. He lent his celebrity to outside civil-rights organizations. As busy as Brickhouse was on the air, he could have booked himself most nights each week doing personal appearances and charity affairs. He said yes as much as he could. “Jack Brickhouse was enthused in whatever he did,” said all-time White Sox pitcher Billy Pierce, whose South Side starts Brickhouse telecast from 1949 to 1961. “He’d go to a banquet and I don’t care what the charity was for, he’d be enthused. He was just that kind of gentleman. He’d go to more banquets than anyone I knew and visit with more charities. Mentoring younger talent also was part of Brickhouse’s regular routine. Brickhouse had to work his way up from a modest upbringing, and he never forgot. Tom Skilling, then in his 20s, appreciated Jack Brickhouse welcoming him to WGN as the new weather forecaster in 1978. Photo credit Robert Feder. WGN weather guru Tom Skilling has now exceeded Brickhouse’s 33 years of continuous service at WGN by three years. Only WLS-TV’s Joel Daly had a longer run at one station. Such a statistic both surprises and shocks marathon-man Skilling, who is on the air during the 11 a.m. to 1 p.m. news, then the 5 p.m. news hour and finally on the trademark WGN News at Nine. That’s not counting WGN-Radio appearances in between, on-line tapings and work for the Chicago Tribune’s weather page. 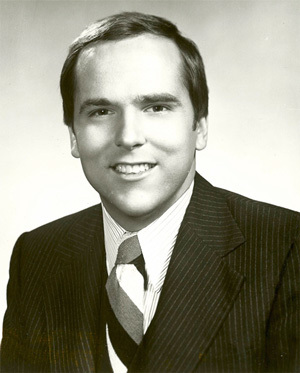 Brickhouse provided a grand welcome for Skilling when he hired on as weatherman in Aug. 1978. Skilling, who had grown up in Aurora, came home after tours of forecasting duty in Florida, Madison and Milwaukee. Skilling got the highest-profile introduction possible when he started at WGN. “I was told I was to report to the Cubs broadcast booth, and Jack would interview me and kind of introduce me to the WGN audience during one of the Cubs games,” he said. “You’re pretty nervous at that stage in that situation. He was so kind. Skilling also appreciated Brickhouse’s on-air ease along with that of anchor Jack Taylor in dealing with the newbie when he joined them on the set for the then-10 p.m. WGN news. And he enjoyed Brickhouse sitting down with the broadcasters in the WGN cafeteria even after he retired from baseball broadcasts. Jack Brickhouse dovetailed from the common fan to Hollywood celebrities. 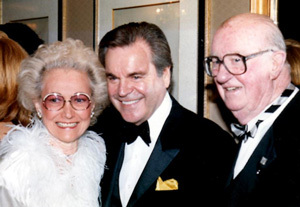 Here, Pat Brickhouse (left) and her husband flank actor Robert Wagner. Another WGN hand who benefited from Brickhouse’s support was Chuck Shriver. 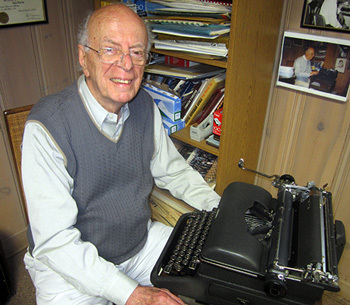 Now 75, the former Cubs and Sox media relations director is retired in Elk Grove Village. In the mid-1960s, Shriver was a young WGN newswriter, sometimes working the imperious Carl Greyson’s “Nightbeat” post-midnight newscast, when Brickhouse invited him to switch over to the sports department in a staff expansion. Among other duties, Shriver wrote scripts for Brickhouse’s 5:55 p.m. studio sportscast, to which the announcer would race after day games at Wrigley Field and old Comiskey Park. “It was kind of funny, he was such a good ad-libber, he really didn’t need a script,” he said. After a while, though, Shriver realized long-term advancement was tough at the station. Rosenberg had a number of decades to go as the top administrator and writer in the sports department. Still, he loved the relationships and camaraderie. 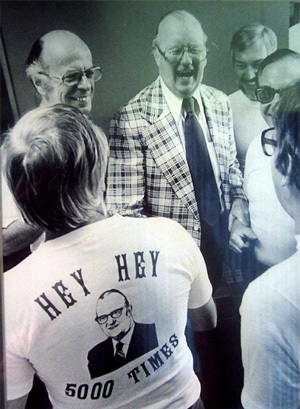 Jack Brickhouse and Jack Rosenberg (left) greet fans celebrating Brickhouse’s 5,000th baseball broadcast in 1979. Shriver expressed to Brickhouse an interest about working for a sports franchise. A while later, after the Cubs looked around for a public relations director to replace ex-first baseman Ripper Collins following the 1966 season, Brickhouse sprung into action. He called Shriver into his office with news of the opening. Then Brickhouse called Cubs general manager John Holland to set up a job interview for Shriver. Shriver worked nine seasons for the Cubs, including the tumultuous 1969 campaign, and continued his close relationships with Brickhouse and Rosenberg. Still another longtime Chicago sports personality who encountered Brickhouse early in his career is WGN (Ch. 9) sports anchor Rick King, who began his career at the station as a producer in 1968-69. So many other stories about Brickhouse using his personality for a greater good abound in Chicago, 16 years after his death. This image behind the first monochrome, then full-color public persona is the key to the measure of the man. He midwifed the careers of many. But the bottom line is the memories he emblazoned in his viewership. Those whose work he touched honored him for his ability and longevity. In 1963, he already had telecast 2,000 games. Both the Cubs and WGN showed their appreciation during a “Leadoff Man” telecast. Watch the ceremony via black and white kinescope of Brickhouse being honored for 2,000 baseball telecasts in 1963. The ceremonies got bigger later in his career. On Aug. 5, 1979, in between the games of a doubleheader against the St. Louis Cardinals at Wrigley Field, Brickhouse was honored for his 5,000th baseball telecast that day. Some 35,769 looked on while Gov. Jim Thompson and Mayor Jane Byrne helped officiate the ceremony. As the festivities wrapped, Brickhouse stated his identifying of the real fans with an emphatic acknowledgement. He turned around, faced the bleachers and bowed. The relationship between announcer, co-workers and the fans at home was two-way. The base was the Brickhouse personality away from the microphone, not as exciting as his “Hey Hey” over an Ernie Banks homer, but just as impactful for so many who benefited.